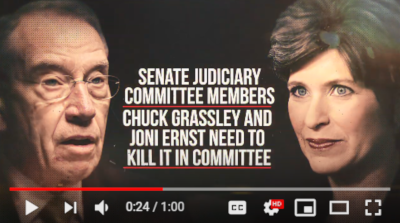 The ad encourages Second Amendment supporters to contact Iowa Senators Chuck Grassley and Joni Ernst insisting they oppose “Red Flag Gun Seizures” (Senate Bill 7) when the bill comes before them on the Judiciary Committee next week! Please click here or below to watch the ad and chip in whatever you can afford to keep it running across the state of Iowa! P.S. Join or Renew with Iowa Gun Owners TODAY! If you’re already a member, click here to chip in with a generous contribution.